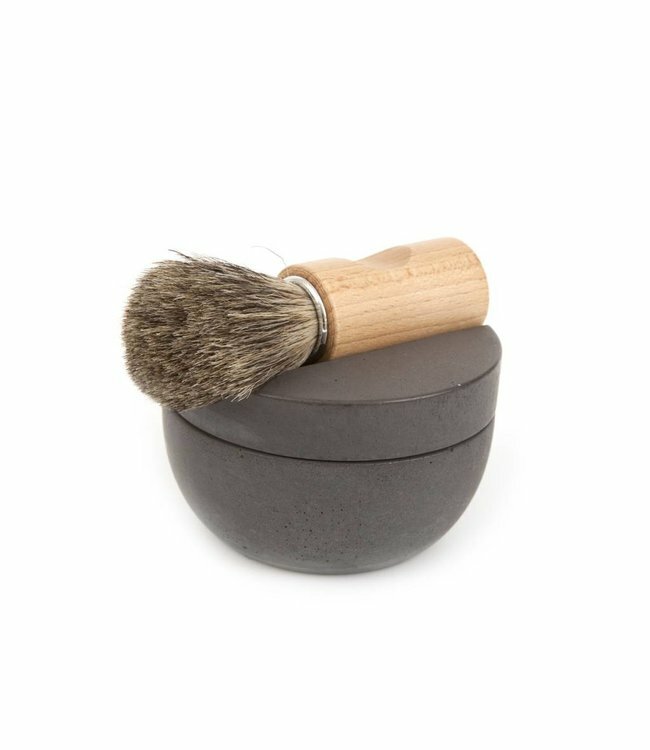 A modern take on a shaving set, the shaving cup is in soft concrete with a round bar of cedarwood shaving soap nestled inside. The shaving brush is beechwood and badger hair. Badger hair absorbs water naturally, making it optimal for shaving brushes. Soft Concrete is a unique material, by adding a small addition of polymer (plastic) it becomes three times as elastic as normal concrete. Soft Concrete is not so soft that it can be bent, it's still a stone material but it has a pleasant feeling to it. It feels warm, soft and comfortable. It contains no environmentally harmful substances. Soft Concrete is cast of a relatively viscous mass that causes the surface to receive a varying smoothness and air bubbles occurs naturally. The irregularity color variations contributes to the vibrant impression.